The Aspex Erie (alone on a big dark lake) is a Classic Sport pair of glasses with interchangeable lenses so you can adjust their performance according to weather conditions. The Erie comes with a hard, zipped carry case plus a cleaning cloth. 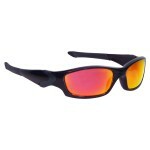 The lenses are CE marked and offer 100% UV400/100 protection. The Erie has a slim fit frame making it most suitable for ladies, youths and pin heads. The Erie features a shiny black frame plus a set of red lenses and a set of inter-changeable light enhancing lenses. 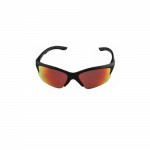 Aspex Erie Ski Sunglasses .